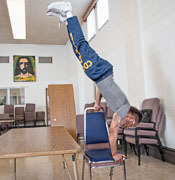 Artistic Ensemble at San Quentin State Prison - 2018 Jan. These photos were made at the last rehearsal before the class performance. The setting is San Quentin's Protestant Chapel; the title of the piece is "Site Unseen". The group is facilitated by Amie Dowling, Freddy Gutierrez, Sebastian Alvarez, Tiersa Nureyev, and Selby Schwartz. 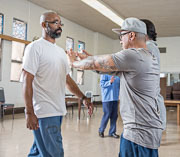 The Artistic Ensemble is sponsored at San Quentin by the Insight Prison Project; it is funded by the Center for Cultural Innovation & the University of San Francisco's Faculty Development Fund.